Ian Lavender: Why I Love Ben Turpin - Slapstick | Bristol's Silent Comedy Festival. Ben Turpin is one of our finest and most neglected on-screen performers. With his trademark crossed eyes and thick moustache he made scores of classic slapstick films alongside the likes of Charlie Chaplin, Mabel Normand and ‘Roscoe ‘Fatty’ Arbuckle’, Turpin’s true forte was impersonating the most dashingly romantic and sophisticated stars of the day and turning them into clumsy oafs. 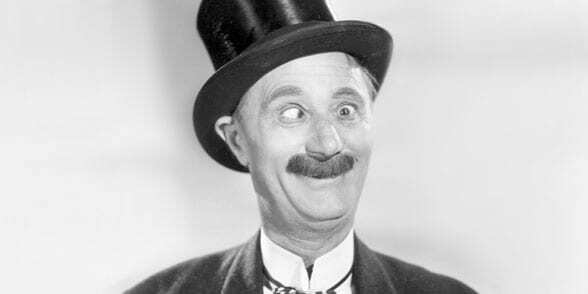 Almost forgotten today, in his heyday, he was one of the funniest and most successful slapstick performers in the business. Join Ian Lavender and discover this unique performer, illustrated with two complete Turpin classic shorts plus extracts from his best on-screen moments. With live piano accompaniment from Stephen Horne. (70mins).